We start the house tour in pictures!Â I know, it has only been like five months that we have been living here.Â I decided to go room by room.Â The benefit of this is that you get a nice detailed look.Â The negative is that it will likely take me another five months to finish*. *I wrote that sentence three days ago.Â See what I mean? 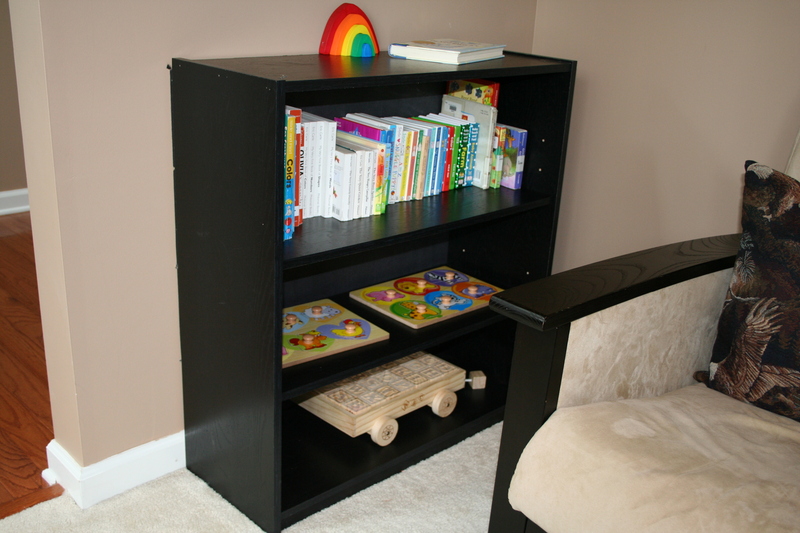 We are starting with the playroom/library.Â When you open the front door, this is the first room on the right. 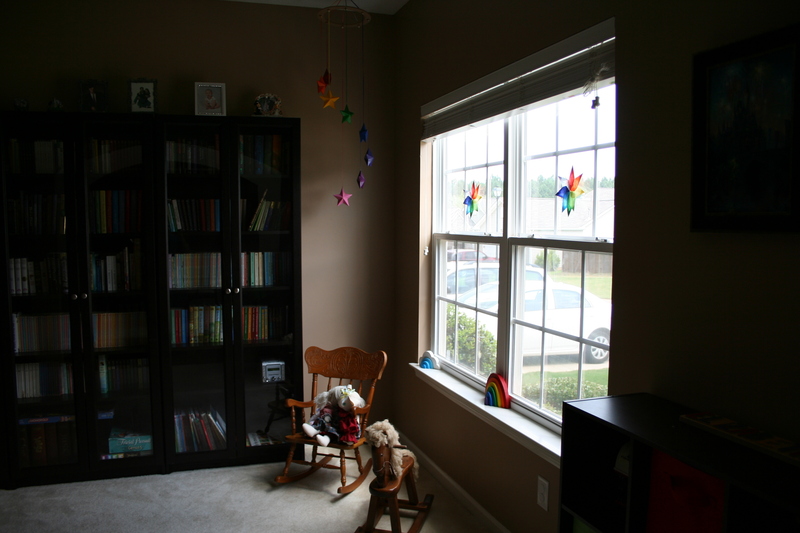 I could not get a good picture of the side of the room by the window.Â Apparently light and dark are outside of my photography skills. 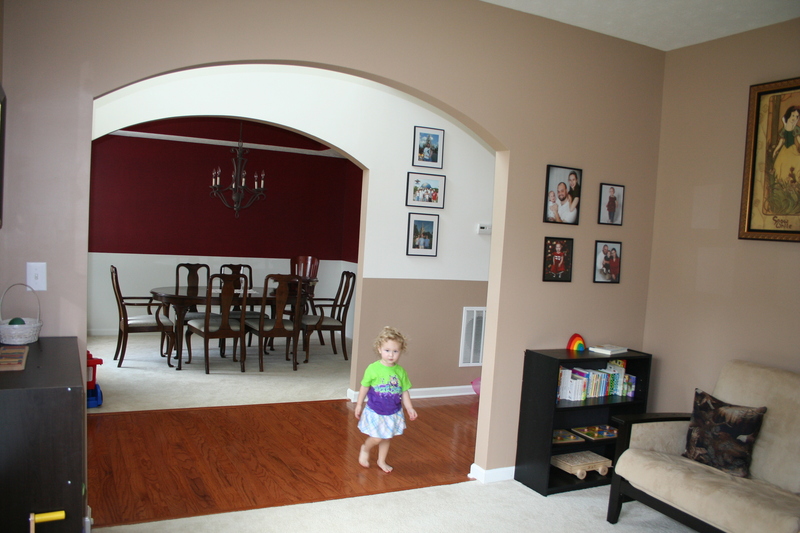 Here is what it looks like when you stand in the corner behind the rocking chair and look out into the dining room. 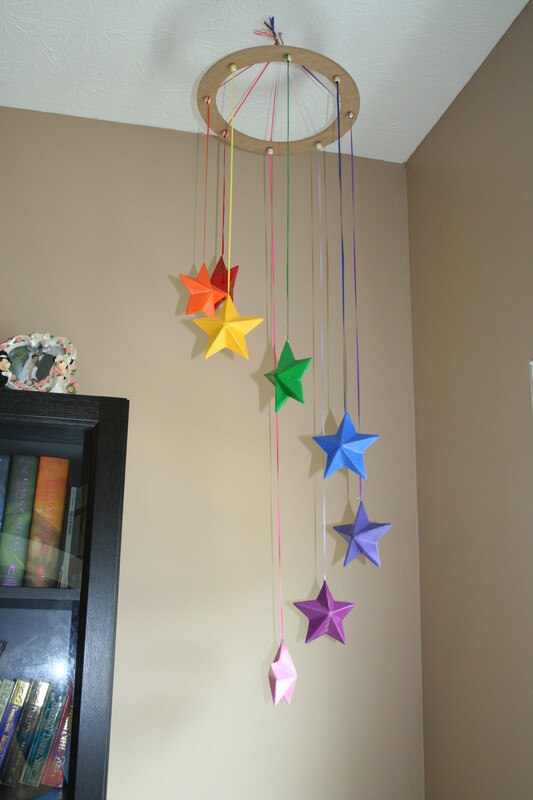 Here is the fancy mobile I made for this room.Â I’m thinking about putting up an Etsy listing for something similar, but I don’t know if anyone would want one and it’d be somewhat expensive to ship. 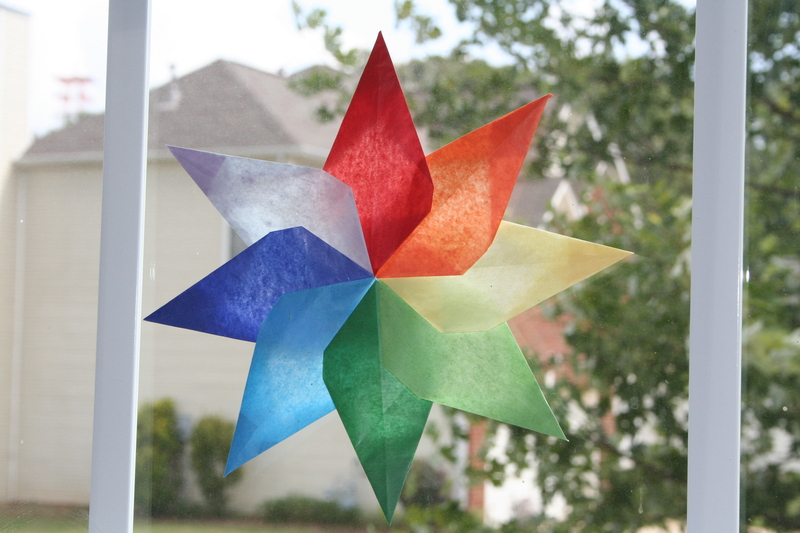 Here are my window decorations.Â I made two, to balance the window.Â It’s made of tissue paper, and oddly, made almost exactly like a paper airplane until you are almost finished. 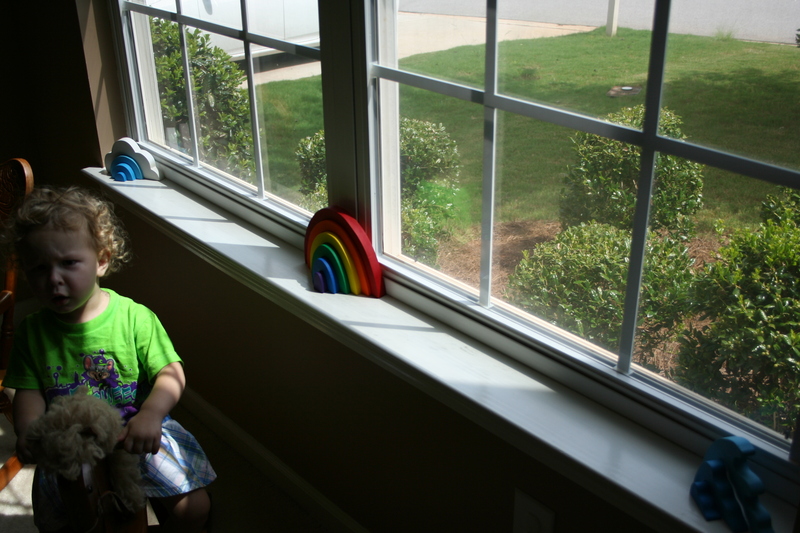 Here is the window, a disgruntled baby, and the new(ish) wooden puzzles.Â I got them off Etsy, from here.Â Funny story there actually.Â I bought my puzzles there and then went back to browse again a couple of weeks later.Â They had up a listing for my rainbow eggs.Â I had several moments of panic, thinking that this big, popular Etsy store had stolen my design!Â Then I calmed down, looked through their old orders and found that they had sold them before I bought from them, they just hadn’t had any listed when I bought, or when I was looking on Etsy when I “invented” the rainbow eggs to see if they were unique.Â So neither of us stole them from the other, we are just both similar geniuses. 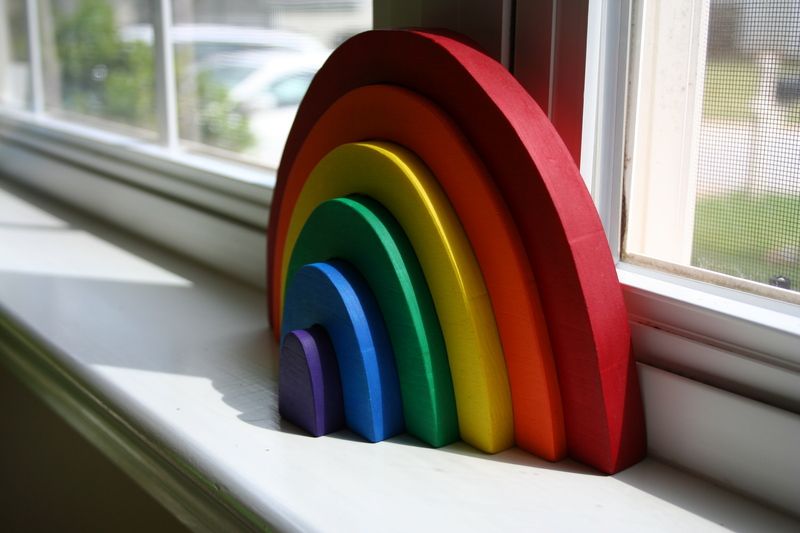 A close up of my rainbow stacker, since it is my favorite.Â Oh, I’m sorry, I mean the baby’s rainbow stacker.Â We also have the little rainbow, the cloud, and the wave. Our toy organization system.Â It is a cube thing from Target with cloth bins in it.Â If something doesn’t fit in the bins, I don’t buy it. 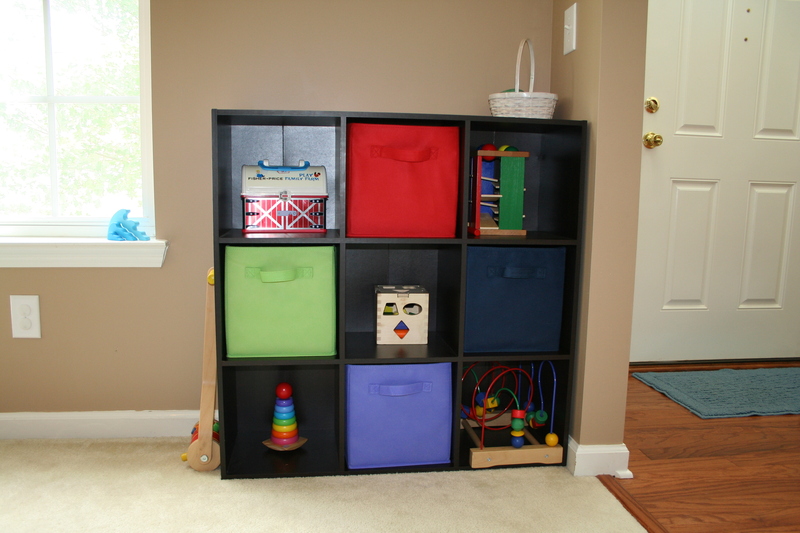 Here is her bookshelf.Â We have filled up the first shelf with books.Â When we get a couple more, I will buy a puzzle shelf (something like this, but perhaps not so elaborate) and move the puzzles to the lower shelf with the blocks. 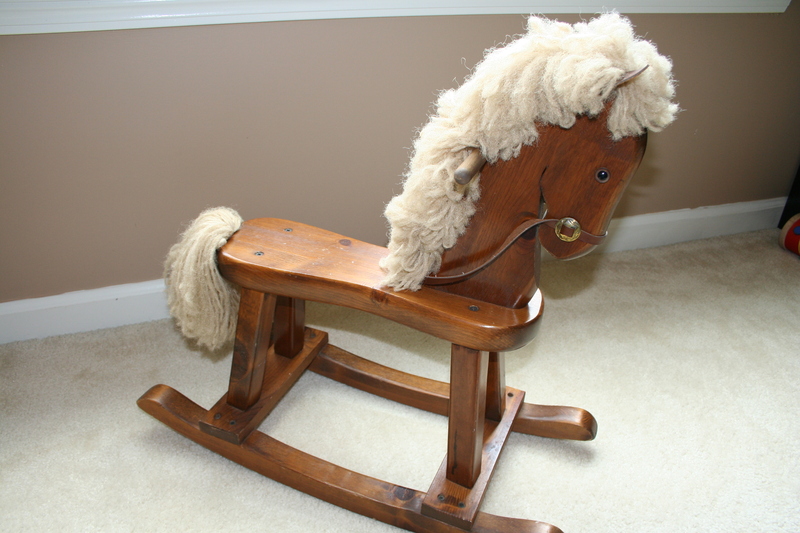 Elizabeth’s rocking chair, which was my rocking chair when I was younger.Â (I’ve never told my parents, especially since my mom hand stained this, but this is most definitely NOT the one I wanted. 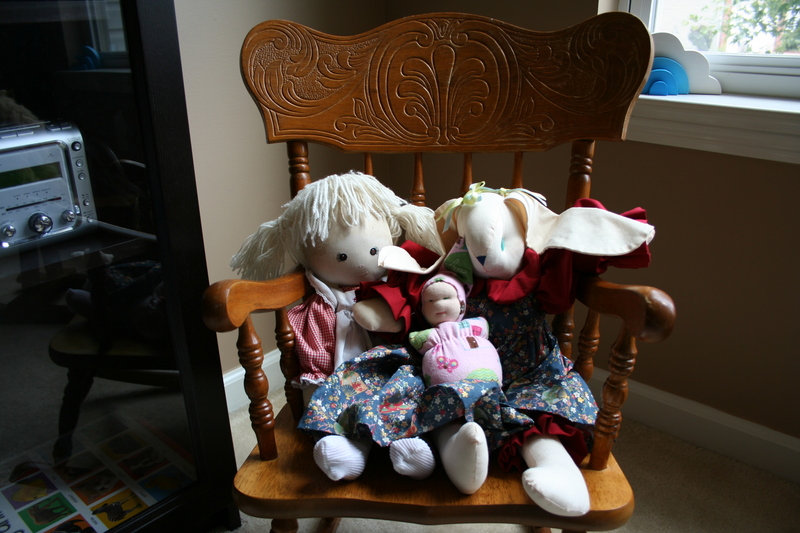 )Â The two big dolls (or doll and rabbit) were mine when I was little and the gnome I bought her on Etsy. 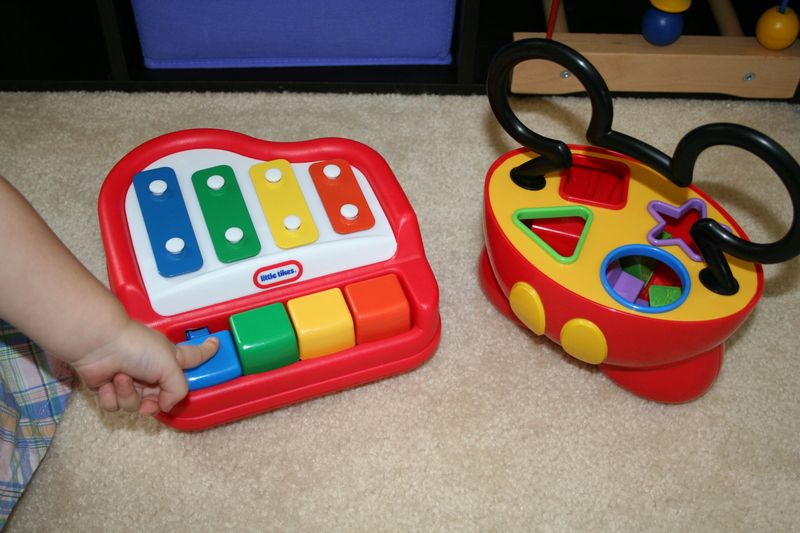 Someone asked me (at least a full year ago now) to do a blog post about Elizabeth’s toys that we like.Â So I dumped all her toys out and took pictures of them while I was taking the pictures of the playroom. 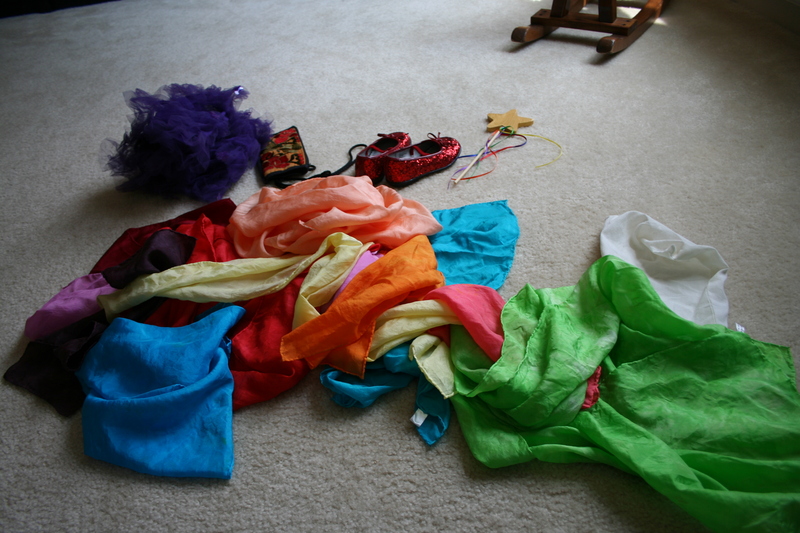 Here are the contents of the red bin.Â It is her dress-up/playsilk bin.Â She has a purple tutu (from Saag and Naan), a purse (that I got as a gift from my Aunt and Elizabeth stole), red sparkly Dorothy shoes (from W), a wand that I made (and will likely end up as a listing on Etsy too someday), and lots of playsilks. 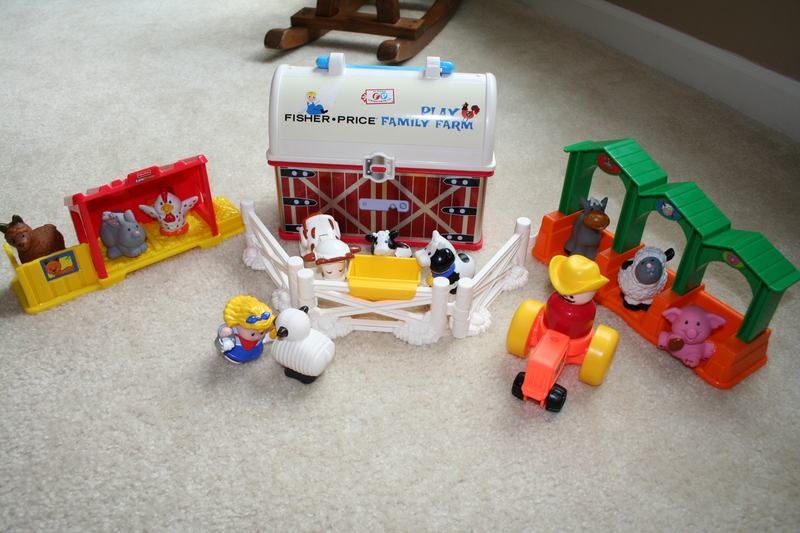 Here is her Fischer-Price Farm that my mom (and dad, but really my mom) got Elizabeth for her birthday/Christmas last year. Here are a couple of random toys.Â They move between bins, but mostly live in the navy blue or the purple.Â (When she gets the play kitchen, the food will be stored there and there will be a doll/stuffed animal bin and these will live in there. )Â The ball came from the same Etsy store as the gnome from above.Â (And I recommend the ball highly.Â She doesn’t charge much for them, they are well made, and great for throwing since they are made out of soft materials.Â It is the only thing Elizabeth is allowed to throw.Â In my opinion, the soft balls from that store are one of the better bargains to be found on Etsy. 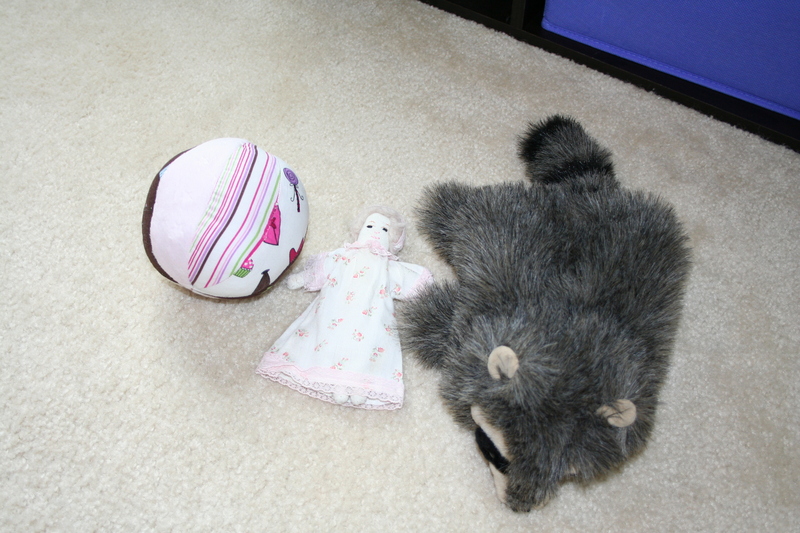 )Â The doll is mine from childhood.Â The raccoon puppet came from my mom. 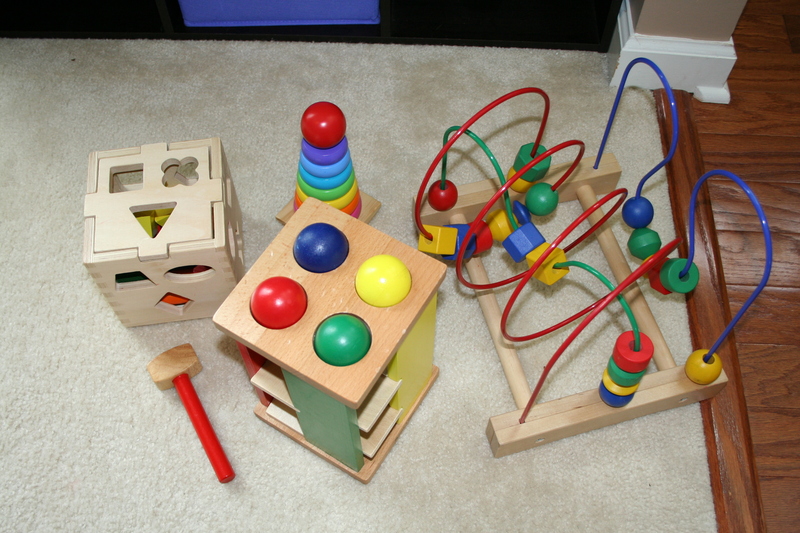 Here are the toys that sit on the open shelves.Â Let’s see.Â Wooden shape sorter from Toys R Us, I think, but they also sell them at Target.Â The wooden ring stacker is from Wal-Mart.Â (Also a fantastic deal, even though they really ought to switch the colors red and pink, come ON!Â Angie, I know you get why. )Â The bead slider thing came from IKEA.Â (Also quite cheap. 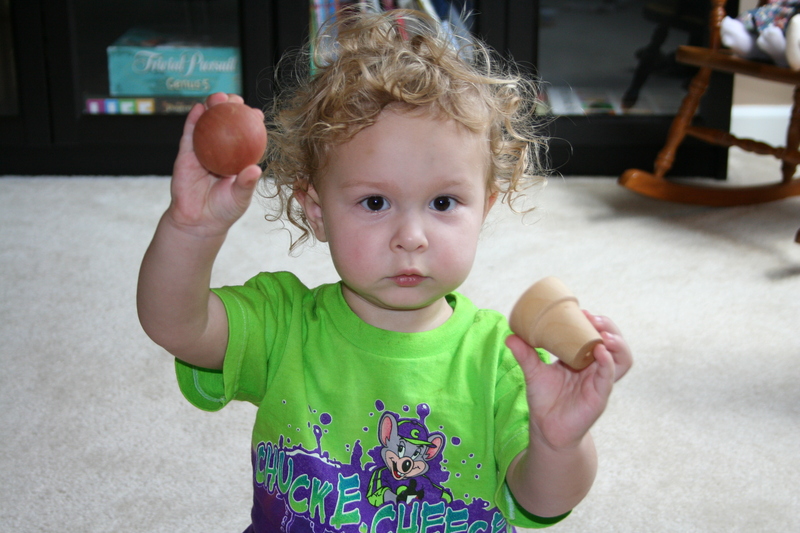 )Â And the wooden ball thing that you whack with the hammer came from Babies R Us and was my Mother’s Day gift.Â Elizabeth picked it out. 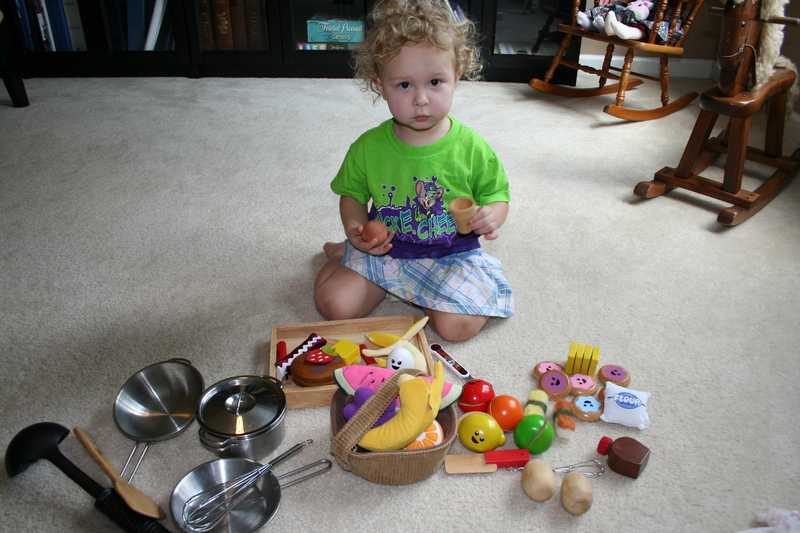 Here are the contents of the purple bin.Â A piano and a Disney shape sorter.Â Elizabeth once put blueberries in the Disney shape sorter. 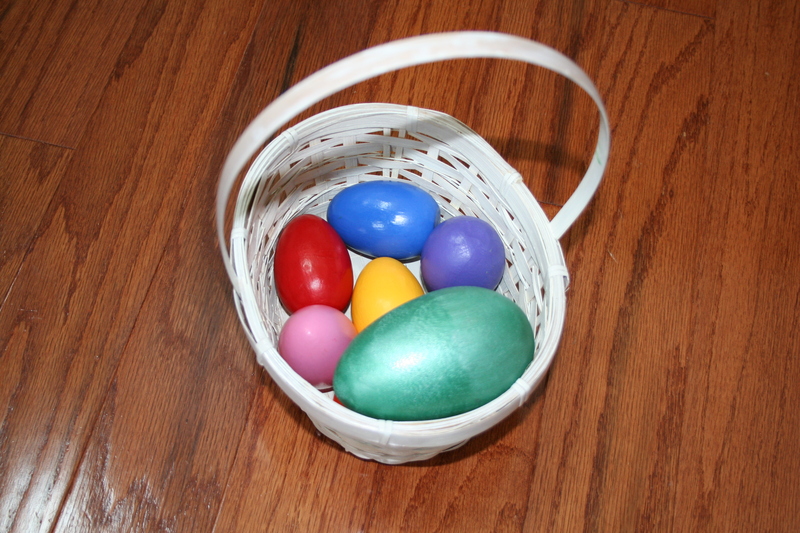 The wooden rainbow eggs in the basket are from my Etsy shop and they sit on top of the toy shelf.Â Still one of Elizabeth’s favorite toys. And that is all.Â Not pictured we have Elizabeth’s truck because she was driving it around and her two metal buckets (the tiny decorative ones from Target) that she was currently using to feed “oats” and “water” to Horse.Â Oh, and she was giving Horse her two felt carrots too.Â Horse gets hungry and thirsty too, you know. Anyway, that is the playroom and those are our toys.Â I try to only have nice looking, non-annoying, open ended toys in our house.Â My patience with noisy toys and Bratz dolls (which I am not even sure they sell anymore) ended years ago when I was teaching.Â (I had a classroom wide ban on Bratz dolls in my second grade.Â I was highly unpopular but I told them if I ever saw a Bratz doll in my classroom, I was keeping it forever.Â They knew I meant it and never brought another one in.Â Bliss. 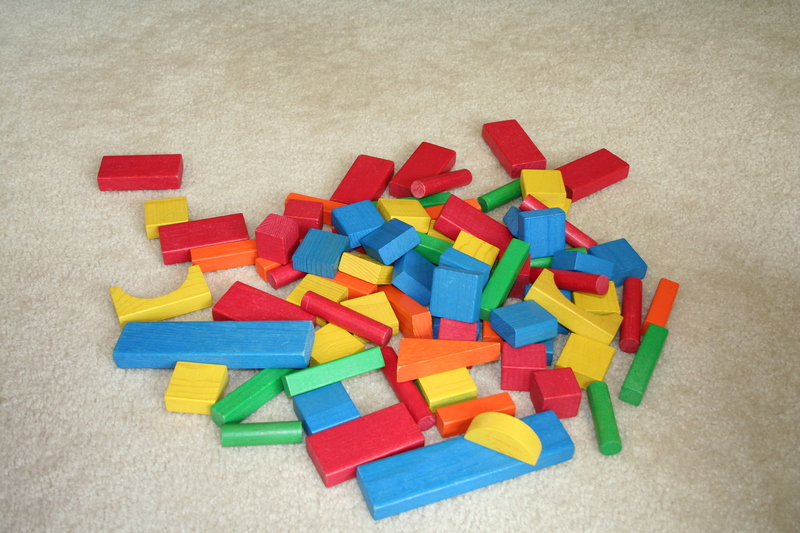 )Â So the toy rule is nothing annoying and only toys that add to the beauty and peace of our house.Â Or at least as much as I can with that.Â I have a good amount of control now, I know I’ll lose some of that later, but it is at least a good start. 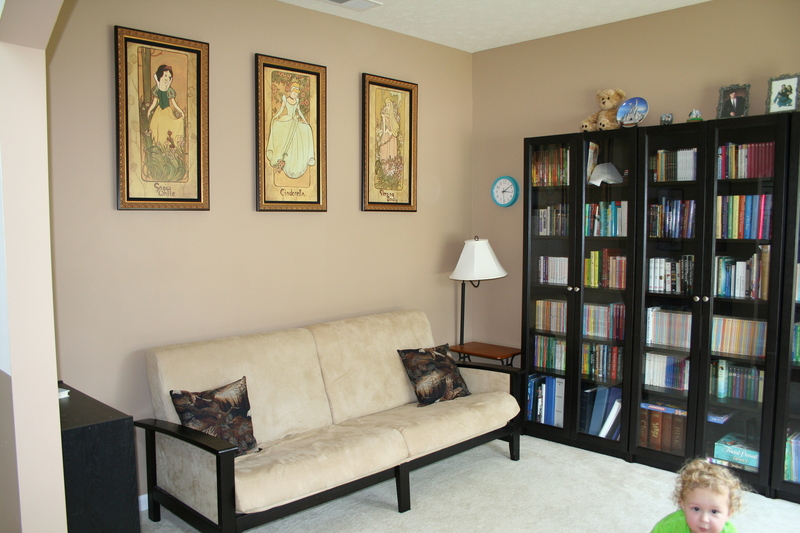 Now, I am accepting advice as well.Â Go back up to that first picture.Â In my room decorating, I’d like to do something cool with the top of the bookshelves.Â Right now they just have family pictures and random knickknacks on them, but I’d like to put something pretty or interesting up there.Â Any ideas? Future plans also include new pillows for the couch, as the current ones aren’t very playroom-y.Â And I’d like to put up some pretty curtains too.Â I’ll accept more decorating advice too, as long as I don’t have to dust it.Â But the playroom is probably closer than any of the other rooms to being complete.